Ouya, which launched today even if many donors don't yet have their machines, is an Android-based, open source console. It'll run emulators. So there's some sensitivity to the issue of piracy, which Ouya didn't help by retweeting out a picture of Super Mario Bros. and adding the hashtag #freethegames. Yesterday an enthusiast—in a tweet removed just within the past half-hour—listed his reasons for owning the console. "Use current controllers, expand ports, and #retro games." 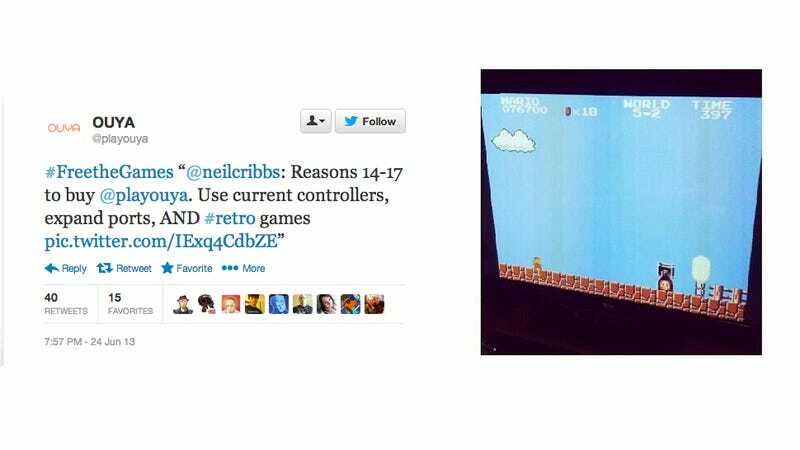 To that he added the image below, which appears to show Super Mario Bros. being played on an Ouya. Ouya's official account, around 8 p.m. on Monday, quoted the Tweet, linking this picture with the addition of the #FreetheGames hashtag to the beginning of it. In March, the discussion of emulators on Ouya's unofficial forums brought a statement from the console maker as to what would and would not be allowable on the device. Ouya said it would accept emulators on the Ouya store provided they didn't include any games to which the emulator didn't have a legitimate license. People who wanted to submit retro games to the Ouya store also would need a license from the owner, and Ouya noted the store does not accept ROMs, which could be pirated material, only the .apk file format. That said, the device has already been shown to run Street Fighter II and Mario 64 on emulation, so even if ROMs or .apks of the games themselves can't be exchanged over the Ouya store, there may be a way still to get them on the open-source console. We've pointed out to Ouya that one console maker's tacit encouragement of playing another console maker's games on emulation is somewhat of a provocative statement. We've asked for comment and will update this post with any that Ouya makes. Update: An Ouya representative responded to Kotaku, restating the company's policies on emulators, content submissions to the Ouya store, and file formats. Ouya's tweet also has been deleted.